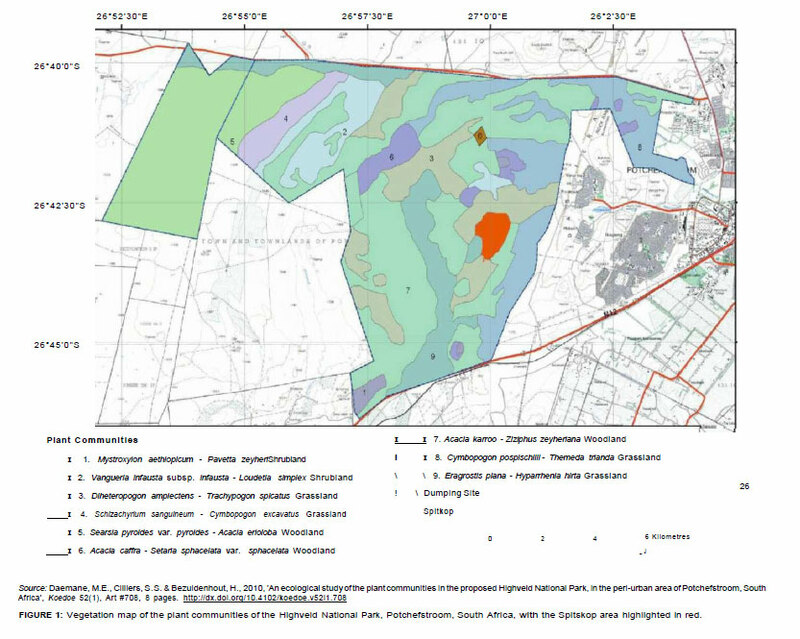 The objective of the proposed Highveld National Park (HNP) is to conserve a considerable area of the poorly conserved Rocky Highveld Grassland and Dry Sandy Highveld Grassveld of the western Grassland Biome in South Africa. The park has not yet been proclaimed, but is currently under the management of the North West Parks and Tourism Board. The main aim of this study was to classify and describe the vegetation in the Spitskop area in the HNP. The areas affected by soil degradation were on the midslopes, footslopes, valley bottomland and the floodplains around the Spitskop hill. The concentrated grazing around the Spitskop area was also influenced by the existing dam in the floodplains. 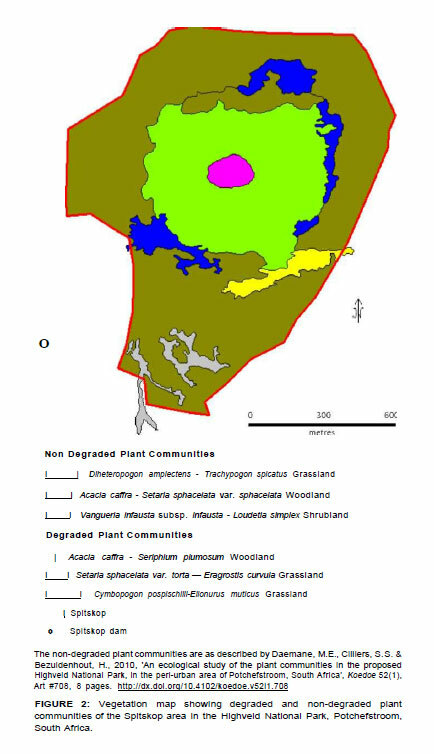 Floristic and soil degradation data were collected and used to classify and describe the plant communities of the Spitskop area. Vegetation sampling was performed by means of the Braun-Blanquet method and a total of twenty plots were sampled. A numerical classification technique (TWINSPAN) was applied to the floristic data to derive a first approximation of the main plant communities. Further refinement was achieved by Braun-Blanquet procedures. The final results of the classification procedure were presented in the form of a phytosociological table, with three major communities and three subcommunities being described. 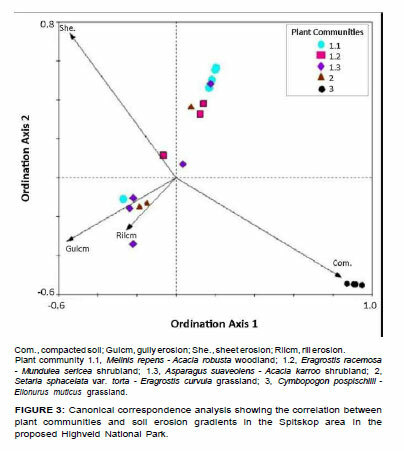 Canonical correspondence analysis was used to determine the direct correlation between plant communities and soil degradation types. Soil compaction and sheet erosion were found to be the most significant variables determining plant community composition. Rill and gully erosion were shown to be of lesser significance in explaining the variation in plant communities. CONSERVATION IMPLICATIONS: Grasslands are amongst the most threatened biomes in South Africa, yet less than 1.3% are currently being conserved. The HNP has significant value for biodiversity conservation and the protection of this area will contribute to the preservation of the highly threatened Highveld vegetation types. The proposal for the development of the Highveld National Park (HNP) dates back to1984, when the then Department of Agriculture decided to inspect all the agricultural campsites surrounding Potchefstroom (North West Province, South Africa) with the aim of renting (Daemane 2007). The investigation showed that the conservation value of the HNP grassland was far higher than its agricultural value and the thought of establishing a conservation area emerged. However, poorly conserved Rocky Highveld Grassveld and Dry Sandy Highveld Grassveld (Bredenkamp & Van Rooyen 1996a, 1996b) in the HNP are currently threatened by increasing urbanisation (Daemane, Cilliers & Bezuidenhout 2010). On the urban fringe of Potchefstroom, urban sprawl has not only transformed large natural areas but also fragmented existing plant communities extensively (Cilliers, Miiller & Drewes 2004). Practices such as harvesting of trees for firewood, uncontrolled fires and overgrazing are some of the challenges facing the management of the HNP (Daemane et al. 2010). A previous study on the phytosociology of the HNP described and subsequently classified the vegetation into nine plant communities (Daemane et al. 2010). However, vegetation sampling for the Spitskop area in the HNP was undertaken separately as some of the areas were characterised by soil degradation with very sparse vegetation cover. In that study soil degradation was not evident in the upper topographical positions such as the crest and the upper slopes of the Spitskop hill (Daemane et al. 2010). The sheet, gully and rill erosions were associated with the midslopes and footlopes of the Spitskop area. Studies on soil degradation found rills and gullies are rarely evident on gradients greater than 10º and typically occur on unconsolidated colluvial or alluvial materials (Cobban & Weaver 1993; Liggitt 1988; Snyman, Van Rensburg & Opperman 1986). Previous studies on soil degradation found soil erosion to be highly depended on land use, slope and climatic factors (Garland 1987; Liggitt 1988). Brady (1993) found the influence of the slope to be strongly interrelated with factors such as soil type. In the Spitskop area, the vegetation communities in the valley bottomland and footslopes were close to the Spitskop Dam and were influenced by overgrazing and trampling (Daemane 2007). The main aim of the present study was therefore to classify and describe the vegetation in the soil-degraded Spitskop area. An understanding of the plant communities and their associated habitats is of fundamental importance for conservation of vegetation and soil and compiling sound management and conservation strategies (e.g. rehabilitation and monitoring). The study focused on the Spitskop area in the HNP, west of Potchefstroom (26º42'45"S-26º43'21"S and 26º59'45"E-27º00'16"E; Figure 1). The areas affected by soil degradation were on the midslopes, footslopes, valley bottomlands and the floodplains of the Spitskop hill. The entire park occupies approximately 10 200 ha and lies between the N12 motorway between Potchefstroom and Klerksdorp in the south, and Eleazer Road in the north. The relatively heterogeneous geology in the HNP is represented by the Witwatersrand and Ventersdorp supergroups and the Transvaal Sequence, with isolated occurrences of Archaean granites and Karoo Sequence sediments (Daemane et al. 2010). The geology in the Spitskop area comprises mostly rocky quartzite outcrops. Soils are heterogeneous and range from sandy to clayey owing to great variation in the parent rock material (Land Type Survey Staff 1984). Soil forms consist mainly of Glenrosa, Hutton and Mispah (Daemane 2007). Mean annual rainfall in the area is approximately 600 mm per year, but can be as high as 900 mm in exceptional seasons (Institute for Soil, Climate and Water 2003). The area experiences great seasonal and daily variation in temperature: the summers are very hot (daily mean maximum temperatures may exceed 32 ºC in January), whilst winters are mild to cold (mean minimum monthly temperatures are approximately 12 ºC) (ISCW 2003). The vegetation of the Spitskop area is dominated by Vangueria infausta subsp. infausta - Loudetia simplex shrubland on the crest. Diheteropogon amplectens - Trychopogon spicatus grassland is associated with the upper midslopes (Daemane et al. 2010). Acacia caffra - Setaria sphacelata var. sphacelata woodland is associated with the lower midslopes, but also extend to the footslopes and bottomlands (Daemane et al. 2010). Bredenkamp and Van Rooyen (1996a, 1996b) classified the HNP area as Rocky Highveld Grassland and Dry Sandy Highveld Grassland. The Bankenveld vegetation type (Veld Type 61), which Acocks (1953) described as 'false grassveld', is dominant in the Spitskop area. The climax veld type is open A. caffra woodland. Vegetation sampling involved 20 releves of 900 m2 each, randomly placed within the stratified units. Stratification was performed based on 1:50 000 aerial orthophotographs showing relatively homogeneous physiographic and physiognomic units. Further stratification was carried out by recognising the terrain types associated with topographical positions. Plant species were identified in each sampling plot and the cover abundance (Barkman, Doing & Segal 1964) of each species was estimated visually. Unknown specimens were identified in the Kimberley South African National Parks Herbarium (KSAN). Plant nomenclature follows Plants of southern Africa (South African National Biodiversity Institute 2009). Average height and canopy cover of tree, shrub and herbaceous strata were estimated and the data were used in the description of the plant communities. Features of the habitat such as geology, soil forms (Macvicar, Loxton & Lambrechts 1991), and rockiness of the soil surface were recorded for each relevé. Classification of erosion type, such as sheet, rill and gully erosion, follows Torrion (2002). The TWINSPAN classification (Hill 1979), which is regarded as a very successful approach by many phytosociologists (Bredenkamp & Bezuidenhout 1995; Cilliers 1998; Mucina & Van der Maarel 1989), was used as a first approximation to analyse the floristic data. The TWINSPAN classification was then refined further by the application of Braun-Blanquet procedures by means of the BBPC-program (Bezuidenhout, Biggs & Bredenkamp 1996). Canonical correspondence analysis, using the CANOCO software version 2.1 (Ter Braak 1986), was employed to determine the direct correlation between plant communities and soil degradation variables. The stepwise ordination approach followed by Mucina and Van Tongeren (1989) was adopted to cope with the heterogeneity of the data set. Descriptive terms such as 'differential species' and 'dominant species' were used following Kent and Coker (1992) and Jennings et al. (2009). 'Differential species' refers to species of medium to low constancy that tend to occur together in a series of quadrats and can thus be used to characterise groups. 'Dominant species' refers to species with the highest percentage of cover, usually in the uppermost dominant layer. Daemane et al. (2010) previously described nine plant communities (Figure 1) for the HNP. A further three major plant communities and three subcommunities occurring in the Spitskop area are described in this study (Figure 2). In the descriptions of the different plant communities, all species groups refer to the phytosociological table (Online Appendix 1). Therefore no repeated reference will be made to Online Appendix 1 in the descriptions of the various plant communities. The vegetation comparisons, where applicable, were made between the plant communities of the Spitskop area and those previously described in the HNP (Daemane et al. 2010) and in the grassland of the former western Transvaal (Bezuidenhout & Bredenkamp 1991; Bredenkamp, Joubert & Bezuidenhout 1989; Cilliers, Van Wyk & Bredenkamp 1999). The Acacia caffra - Seriphium plumosum woodland occurred in the rocky midslope of the quartzite outcrops and was associated with sheet, gully and rill erosion. The Glenrosa soil form was dominant in this habitat. Differential species of this community, indicated by species group A, included Acacia caffra, Seriphium plumosum, Gomphocarpus fruticosus subsp. fruticosus, Aristida bipartita and Convolvulus sagittatus. The dominant species in this community were Diospyros lycioides subsp. lycioides (species group D); Mundulea sericea subsp. sericea (species group F); Eragrostis racemosa, Urochloa panicoides, Searsia pyroides var. pyroides and Euclea undulata (species group H); Acacia karroo, Setaria sphacelata var. sphacelata and Ziziphus zeyheriana (species group L), and Melinis repens var. repens, Aloe greatheadii var. davyana, Cynodon dactylon, Themeda triandra, Hyparrhenia hirta and Asparagus suaveolens (species group M). On average, 18 species were recorded per sample plot. The average height of the tree stratum was 1.6 m with a canopy cover of 10.5%. The average height of the shrub stratum was 0.5 m and the canopy cover was 5.7%. The average height of the herbaceous layer was 0.2 m, with a canopy cover of 3.1%. A closely related community in the park, Acacia caffra - Setaria sphacelata var. sphacelata woodland (Daemane et al. 2010), had an average of 40 species per plot and herbaceous and tree cover of 61.7% and 11.2%, respectively. Species such as S. plumosum, A. greatheadii var. davyana and A. suaveolens were the most common and abundant species in both these plant communities. Acocks (1988) attributed the increase of these species to conditions of severe degradation due to overgrazing. Uncontrolled fires, gathering of trees for firewood and accompanying disturbances, such as trampling and soil compaction by livestock, were found to be the major threats to these plant communities (Cilliers et al. 1999; Daemane et al. 2010). The Acacia caffra -Seriphium plumosum woodland community was divided into the three sub-communities described below. This plant community occurred in the rocky midslope of the quartzite outcrops and was associated with sheet, gully and rill erosion. Sheet erosion was severe, covering up to 92% of the soil surface. Glenrosa soil form was dominant in this habitat. Differential species of this community, indicated by species group B, included the grass Panicum maximum and the tree Acacia robusta subsp. robusta. The dominant shrubs in this community were Acacia caffra and Seriphium plumosum (species group A); Eragrostis racemosa and Searsia pyroides var. pyroides (species group H); and Diospyros lycioides subsp. lycioides (species group D). On average, 16 species were recorded per sample plot. The average height of the tree stratum was 1.3 m and the canopy cover was 5.2%. The average height of the shrub stratum was 0.5 m and the canopy cover was 1.8%. The average height of the herbaceous stratum was 0.2 m, with a low canopy cover of 1.0%. The Mundulea sericea subsp. sericea -Eragrostis racemosa shrubland occurred in the rocky midslope of the quartzite outcrops and was associated with sheet, gully and rill erosion. Sheet erosion was severe, covering 83% of this plant community. Glenrosa was the dominant soil form. The differential species in this community was found in species group C and consisted of only one species, Indigofera sp. ; species group B was absent from this subcommunity. Dominant species in this community included Acacia caffra, Seriphium plumosum and Gomphocarpus fruticosus subsp. fruticosus (species group A); Diospyros lycioides subsp. lycioides and Clematis brachiata (species group D); Mundulea sericea subsp. sericea (species group F); Eragrostis racemosa (species group H); Setaria sphacelata var. sphacelata (species group L), and Melinis repens var. repens, Aloe greatheadii var. davyana, Cynodon dactylon and Themeda triandra (species group M). On average, 17 species were recorded per sample plot. The average height of the tree stratum was 1.5 m, with a canopy cover of 9.3%. The average height of the shrub stratum was 0.5 m and the canopy cover was 5.3%. The average height of the herbaceous layer was 0.1 m and the canopy cover was 2.3%. The Acacia karroo - Asparagus suaveolens shrubland occurred in the footslopes and was associated with sheet, rill and gully erosion. Sheet erosion covered 71% of the surface area. Hutton and Glenrosa were the dominant soil forms. The differential species of this community, indicated by species group E, included Senecio sp., Atriplex sp. and Lantana rugosa. The dominant species were Acacia caffra, Seriphium plumosum, Aristida bipartita and Convolvulus sagittatus (species group A); Mundulea sericea subsp. sericea (species group F); Urochloa panicoides, Searsia pyroides var. pyroides and Eragrostis racemosa (species group H); Acacia karroo, Setaria sphacelata var. sphacelata and Ziziphus zeyheriana (species group L), and Melinis repens var. repens, Aloe greatheadii var. davyana, Cynodon dactylon, Themeda triandra, Hyparrhenia hirta and Asparagus suaveolens (species group M). On average, 21 species were recorded per sample plot. This plant community was affected by sheet, rill and gully erosion. Sheet erosion covered 71% of the surface area. The average height of the tree stratum was 2.1 m and the canopy cover was 17%. The average height of the shrub stratum was 0.6 m, with a canopy cover of 10%. The average height of the herbaceous stratum was 0.2 m and the canopy cover was 6.0%. A closely related plant community, Acacia karroo - Ziziphus zeyheriana woodland, was described by Daemane et al. (2010). Bredenkamp et al. (1989) described a closely related community, the A. karroo woodland, also occurring on severely degraded land but with a higher tree cover (30%). Species such as Z. zeyheriana, A. greatheadii var. davyana and A. suaveolens were common in all these plant communities and seem to be increasing under conditions of severe overgrazing, as noted by Bredenkamp et al. (1989). This plant community occurred in the footslopes and was associated with sheet, rill and gully erosion. Sheet erosion covers an average of 76% of the soil surface. Hutton and Mispah were the dominant soil forms. The differential species in this community were in species group G and included Eragrostis curvula, Digitaria eriantha, Setaria sphacelata var. torta, Grewia flava, Asparagus laricinus and Solanum lichtensteinii. Dominant species in this community were Eragrostis racemosa and Searsia pyroides var. pyroides (species group H); Chrysocoma ciliata and Eragrostis lehmanniana var. lehmanniana (species group K); Acacia karroo (species group L), and Melinis repens var. repens, Aloe greatheadii var. davyana, Cynodon dactylon, Themeda triandra, Hyparrhenia hirta and Asparagus suaveolens (species group M). On average, 23 species were recorded per sample plot. The average height of the tree stratum was 1.2 m and the canopy cover was 11.2%. The average height of the shrub stratum was 0.3 m and the canopy cover was 6.8%. The average height of the herbaceous layer was 0.2 m, with a canopy cover of 5.4%. The Cymbopogon pospischilii -Elionurus muticus grassland occurred in the valley bottomland and floodplains. This plant community was characterised by bare patches of compacted soils resulting from overgrazing and trampling by livestock. Hutton and Mispah were the dominant soil forms. The differential species for this community were in species group I and included Elionurus muticus, Eustachys paspaloides, Aristida congesta subsp. congesta, Sida alba, Vernonia oligocephala and Gomphrena celosioides. Dominant species in this community included Cymbopogon pospischilii (species group J); Setaria sphacelata var. sphacelata, Acacia karroo and Ziziphus zeyheriana (species group L), and Melinis repens var. repens, Aloe greatheadii var. davyana and Cynodon dactylon (species group M). On average, 17 species were recorded per sample plot. The average height of the tree stratum was 1.0 m, with a canopy cover of 0.5%. The average height of the shrub stratum was 0.6 m and the canopy cover was 1.0%. The average height of the herbaceous layer was 0.4 m and the canopy cover was 2.9%. The environmental gradients and the relative importance and intercorrelation of the environmental variables are shown by the arrows by the canonical correspondence analysis (Figure 3). On axis 1, compacted soil was the most important variable determining the species composition. The eigenvalue for the first ordination axis of the plant communities/ environment biplot was 0.28, representing 34.9% of the total variance. On axis 2, sheet erosion was the most important variable determining species composition. The eigenvalue for the second axis was 0.23, representing 63.5% of the total variance. Thus, the two axes account for 98.4% of the variance in the plant communities. Rill and gully erosion were of lesser significance in explaining the species composition. The two different associations between vegetation and soil compaction or sheet erosion emerged clearly in two separate parts of the diagram. The Seriphium plumosum - Acacia caffra woodland (including three subcommunities) and the Setaria sphacelata var. torta -Eragrostis curvula grassland were associated with sheet erosion. The Cymbopogon pospischilii -Elionurus muticus grassland was associated with compacted soils. Many of the plant communities previously described in the grassland of the North West Province (Bredenkamp et al. 1989; Cilliers et al. 1999; Daemane et al. 2010) showed some floristic affinities with the plant communities described in the Spitskop area. According to Guardia and Ninot (1992), the vegetation of the degraded areas retains a strong floristic similarity to the better preserved vegetation patches in close proximity. In the Spitskop area, the vegetation was characterised by relatively low plant cover and lower species richness compared to the non-degraded plant communities described by Daemane et al. (2010) and other plant communities previously described in the area (Bredenkamp et al. 1989; Cilliers et al. 1999; Daemane et al. 2010). The general trends concerning the regressive dynamics of plant communities caused by soil degradation include decrease of vegetation cover and a reduction in species richness (Guerrero-Campo & Montserrat-Marti 2000; eds. Morgan & Rickson 1995). The results from the Spitskop area showed that woody species such as Acacia caffra, Searsia pyroides var. pyroides and Acacia karroo have decreased in their cover and abundance compared to the similar, less degraded plant community of the HNP (Daemane et al. 2010). Other woody species, such as Searsia leptodictya and Ehretia rigida found in the Acacia caffra - Setaria sphacelata var. sphacelata community of the HNP (Daemane et al. 2010) have been lost in the degraded communities of the Spitskop area. Grasses such as Themeda triandra, Digitaria eriantha, Elionurus muticus, Heteropogon contortus and Cymbopogon pospischilii have also declined in cover in the Spitskop area. The grass Cynodon dactylon has been totally lost in the areas affected by sheet erosion and where the soil has been compacted by livestock. Overall, the ordination results indicated that the species composition was affected largely by sheet erosion and soil compaction by livestock. The Spitskop area is also close to the dam and concentrated grazing was one of the factors that contributed to the formation of sheet erosion and soil compaction. According to Valentin, Poesen and Yong (2005) water infiltration is low in areas affected by sheet erosion and compacted soil, resulting in low vegetation cover and species richness. Cattle tracks were observed to cause the formation of rill and gully erosion where a concentration of water runoff occurred (Daemane 2007). Rill and gully erosion were mostly associated with the midlopes and the footslopes of the Spitskop hill. However, gully and rill erosion were found to be of lesser significance in explaining species composition in the Spitskop area. In general, the destruction of the protective vegetation cover by overgrazing, trampling and wood harvesting contributed to soil and vegetation degradation in the Spitskop area (Bredenkamp et al. 1989; Cilliers et al. 1999; Daemane 2007). The combination of these factors seemed to have enhanced the aridity of the area because of the reduction in vegetation cover. The rate of soil erosion is also highly dependent on land use, slope and climatic factors (Garland 1987). Observations in the Spitskop area showed that the slope of the Spitskop hill also contributed to the accelerated erosion. Although experimental trials were not undertaken to validate the effect of slope on erosion, rills and gullies were associated with the midslopes and footslopes of the Spitskop hill. According to Valentin et al. (2005), water runoff from steep slopes reach lower slopes with intense velocity, resulting in soil erosion. In areas where sheet erosion and compacted soil were pronounced, the upper layers of the soil profile had already been lost, without any organic matter left. Only a few species, such as Seriphium plumosum, Ziziphus zeyheriana, Mundulea sericea subsp. sericea and Aloe greatheadii var. davyana, were abundant and their covers seemed to increase under conditions of severe sheet erosion and soil compaction by livestock. The results obtained in this study highlighted the ecological relationship between vegetation and soil degradation. The proposed strategies for soil conservation are based on covering the soil for protection from natural and humaninduced disturbances. Rehabilitation measures such as mechanical soil cultivation, brush packing and stone packing proved effective in areas elsewhere affected by sheet erosion and soils compacted by livestock (Coetzee 2005; Van der Merwe & Kellner 1999; Wight & White 1974). The gullies and rills can also be addressed by stone packing and the use of gabions can be applied in severe conditions (Coetzee 2005). The dam also needs to be rehabilitated to reduce the concentrated grazing around the Spitskop area. Development of a fire management plan for the park to minimise the impact of fire on vegetation structure and cover is suggested. A resource use policy also needs to be developed to address the issues such as firewood collection within the park. The ecological interpretation derived in this study will therefore be a valuable tool for development of a rehabilitation plan and the general conservation management of this grassland area. The following individuals and institutions are sincerely thanked: South African National Parks for financing this study; North-West University for supporting the research; Dr. Stephen Holness and Ms. Phozisa Mamfengu for assisting with maps; Mr. Abbey Legari for assisting with fieldwork and the HNP Founding Partners for allowing us to undertake this study. M.E.D. (South African National Parks) was responsible for vegetation sampling and writing of the manuscript, S.S.C. (North-West University) assisted with the ordination analysis and H.B. (South African National Parks) assisted with the TWINSPAN data analysis and classification of plant communities.